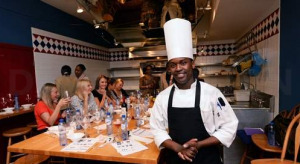 We are excited to announce that on Tuesday, November 4th, Reefs chef David Ndungi was named Bermuda's Rising Chef of the Year in 2014! Chef David beat out stiff competition and we are so proud of his achievements. Next time you're dinging in one of our restaurants, know that a rising star is cooking your delicious meal. "The 31-year-old chef de partie beat out tough competition from three other culinary professionals with his melange of chicken dish. He won an all-expenses-paid trip to a New York butcher's, a crystal decanter, wines and a $350 gift certificate from International Imports. Mr. Ndungi said he was ecstatic after the win. "It feels like I just walked into a casino and won the jackpot, so I'm very happy about it." From day one of the competition, Mr. Ndungi was certain he would come out on top. He said: "I was confident with what I was going to do and took advantage of the fact that many of the competitors had parts of their dishes prepared in advance. I came up with a menu that would take me 25 minutes, but that I could create it all from scratch."